Eat Vince Gilligan to 'Breaking Bad' Fans: Throwing Pizza on Walter White's Roof is "Just Not Cool"
Vince Gilligan to 'Breaking Bad' Fans: Throwing Pizza on Walter White's Roof is "Just Not Cool"
Pizza is too good to waste, says the "Better Call Saul" co-creator. Yesterday’s episode of the Better Call Saul podcast opened with a rather serious PSA from co-creator Vince Gilligan. 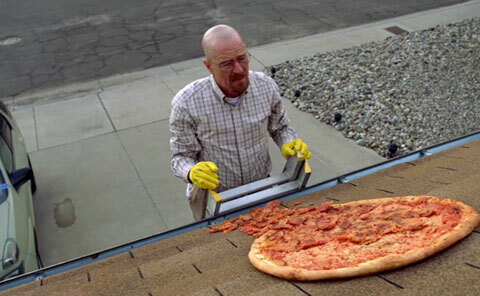 “Breaking Bad” fans will recall a scene in season 3, episode 2 in which Walter White tosses a pizza on the roof of his Albuquerque residence. As it turns out, this scene has prompted a rash of tourists to visit White’s home—years after this episode aired—and attempt to recreate the scene. Listen to Gilligan’s full plea in the podcast above.